Do you miss the tandem of Katrina and Daniel of the remarkable ‘Walang Hanggan’ TV series? Well, here comes the two of today’s beautiful actor and actress of the decade, Coco martin and Julia Montes bringing you A Moment in Time movie to be release on February 13, 2013 as a Valentine offering of Star Cinema to all the beloved movie goers. After their very successful TV series ‘Walang Hanggan’, here they are again ready to conquer the screen and will make our hearts beat fast again. 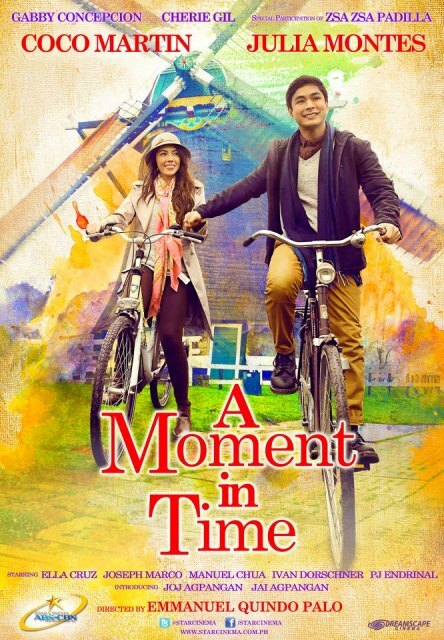 A Moment in Time is romantic movie with comedy love story directed by Direct Emmanuel Palo taken from Netherlands, and Amsterdam. This movie is likened to a movie ‘Milan’ taken at Italy, and currently the TV series a Beautiful Affair. Moment in Time was made to make all the Filipinos fall in love this February. More mature roles will be given to Julia Montes as Jullian and Coco Martin as Patrick in Moment in Time. Other Moment in Time important casts includes Mr. Gabby Conception, Ms Cherry Gil and Ella Cruz, Zsa Zsa Padilla, Joseph Marco, Ivan Dorschner, Manuel Chua, Joj Agpangan, Jai Agpangan, PJ Endrinal.